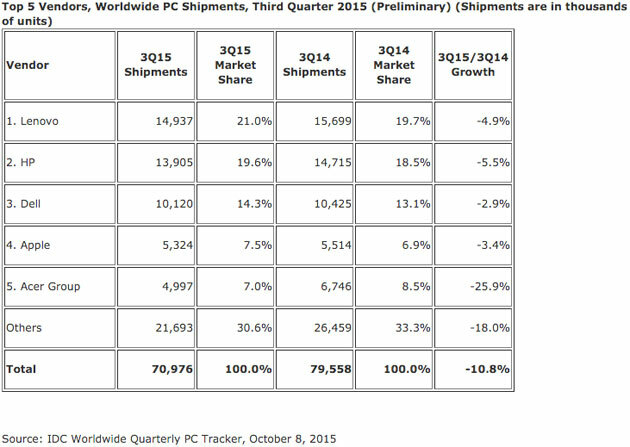 Windows 10 may have breathed new life into your PC, but it didn't do anything to juice PC sales this summer. Both Gartner and IDC estimate that computer sales dropped several points year-over-year (between 7.7 and 10.8 percent) in the third quarter, right when the new Windows arrived. That's one of the steeper drops in recent memory, in fact. Not that it comes as a complete surprise. As the analyst firms explain, Microsoft's fast-tracked release left many PC makers shipping existing systems with Windows 10, which weren't going to drive demand as much as brand new models. You're not going to buy a months-old laptop just because it's running new software, are you? The big question is whether or not the wave of new Windows 10 PCs launching this fall will make a difference -- if there's still a sharp decline, the industry is really in trouble. The new platform wasn't the only factor at work, of course. The researchers blame the downturn on a combination of a stronger US dollar (which hiked PC prices in many other countries) and a transition away from old Windows 8 PCs. Some vendors fared better than others, though. As a rule, big-name brands like Apple, Dell, HP and Lenovo (the market leader) have emerged relatively unscathed -- it's the smaller, more vulnerable companies that are shedding legions of customers. Even Acer and ASUS saw sales plunge by over 10 percent. It's too soon to say if Windows 10 will stop the bleeding, but the days of booming computer businesses appear to be long gone.